Four finalists advance to Regional Spelling Bee - Hamilton School District. Students in sixth through eighth grades competed Feb. 6 in the annual District Spelling Bee at Templeton Middle School. The “district” is a geographical area defined by CESA #1, which sponsors district and regional bees. Students who won classroom spelling bees vied for the honor of participating in the district event. The champion speller was sixth-grader Lucas Vera Paez. Finalists who will also advance to the regional bee are: Kaitlin Belke, grade 7; Olivia George, grade 8; and Audrey Davies, grade 8. In honor of their spelling achievement, the top four spellers received trophies. Top spellers at the district level advance to the regional competition Feb. 18 at the CESA #1 office in Pewaukee. 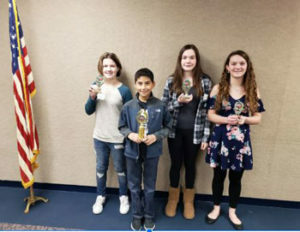 Regional winners continue to the Wisconsin Spelling Bee, in hopes of qualifying for the Scripps Howard National Spelling Bee, held in Washington, D.C.
grade 8 – Scotland Nicholson, Olivia George, Varun Nuthi, Audrey Davies, William LaCroix and Dayton Licklider. The event was coordinated by Templeton teacher Tim Cunningham and judged by Lisa Schmeling and Patty Sankey.